After so many weeks of playing catch up with noisy neighbour Manchester City, defending champions Manchester United finally go on top on the 28th game. Both teams are now out of Europa League following their early exit from the prestigious UEFA Champions League. 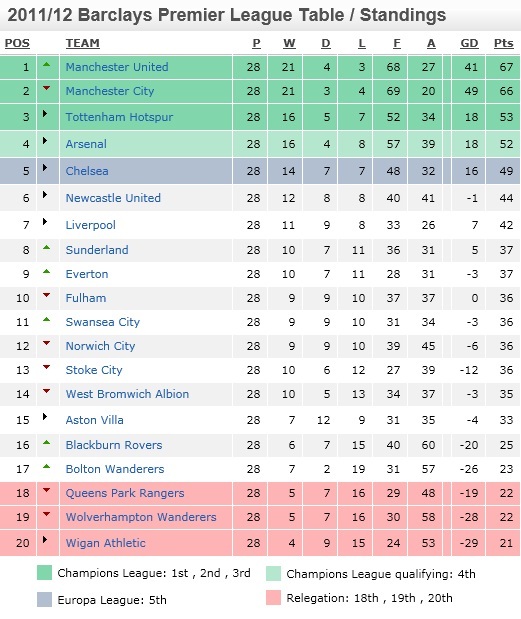 English Premier League standings after 28 games. There are 10 more games left to play. For United, the domestic league is the only hope for a silverware this season, trying to defend the titled they won last season. For city, this is the closest they have come to in an attempt to claim their first premier league title since 1967/68 season. So, I'll mark Sunday, Mar 11, 2012 as the turning point for United to have turn things around for the better. United go top with 67 points to City's 66 points. Been there, done that, so many times. United visit Wolverhampton tomorrow and if they can get maximum points they'll be 4 points clear at the top. City play Chelsea in the mid-week and pressure will be on them if United win at Molineux Stadium. Prediction for tomorrow's game: 2 - 0 to United. So, come on you guys! Go! Go United! I hope your team wins!! M.United mauled the Wolves 5 - 0 at Molineux Stadium and went 4 points clear at the top. Wayne Rooney didn't score, tho.